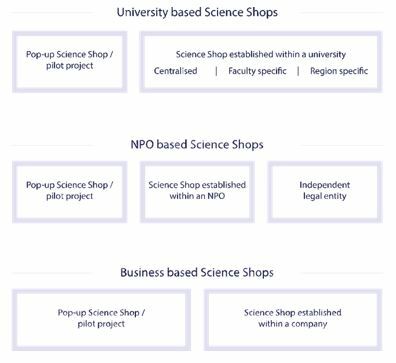 A new report produced by the EU SciShops project seeks to provide insights into some of the key aspects that influence how a Science Shop operates, their interdependencies, and how developments relating to these key aspects might affect its growth, stability or decline. In order to reflect the diversity of existing and future models of Science Shops, the report looks at how these key aspects can play out in different types of Science Shops, including those based at universities, non-profit organisations, and businesses as well as ones established as independent legal entities. For each of these aspects, possible operational options are identified and the advantages and disadvantages of the identified operational options are discussed as well as their interdependencies. For example, the organisation model may affects the availability of infrastructure options and staff for coordination and project implementation. The availability of expertise (staff) will affect the thematic scope and types of projects that can be undertaken. Freedom and flexibility (with regard to how it is run, funded, branding etc). The results of this analysis highlight some differences between Science Shops, especially between university-based and NPO-based Science Shops. Reflections on the business-based model, which are currently mainly hypothetical, indicate that these Science Shops might correspond more closely to the NPO-based model. University-based Science Shops have some particular advantages in terms of their better access to continuous securer funding, to students and supervisors, and to infrastructure, such as laboratories, libraries and dissemination channels. Thus, it is quite common for university-based Science Shops to conduct more projects on a wider range of topics. On the other hand, Science Shops based at NPOs, and possibly businesses, are not dependent on governmental or university policies and requirements. They can therefore be more independent, flexible and creative, as well as more involved in action research, the facilitation of stakeholder engagement, and production of services and products for civil society more than research-oriented universities. In addition, several key developments are identified for each key aspect. These developments consist of both challenges and opportunities, from both within and outside of the organisation, which can have a profound impact on how the Science Shop is run. For example, receiving project funding provides an opportunity for growth, while the end of project funding presents a challenge; a new member of staff joining a science shope may bring in new competencies and opportunities for new projects, while the loss of a key person can present a threat. All options and developments are illustrated with real-life case studies, wherever possible. As the examples show, the life cycle of a science is rarely a linear process and many science shops undergo periods of growth and decline, often due to changing conditions and environments. The report highlights also some of the options for science shops when facing these types of challenges.